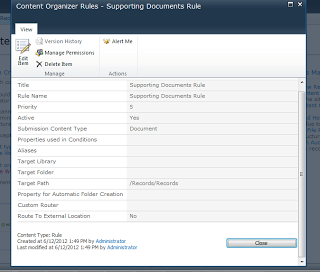 Here is how to Create a Record Center Sub Site , and add a Content Organizer rule to it. First, We need to Create the Subsite. The Template “OFFILE#1” is the Template for Record Center. 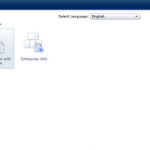 You can find all Sharepoint Templates here. Now, here is the chunk of code to Create the Content Organizer Rule. As you can see, this rule routes the Content Type “Document” to the /Records/Records Library. I am using a variation on this script posted here my script pulls from a CSV file because I have over 600 rules to add. The script works and the rules work, however as I add more and more rules the time to create them increased, from 10-15 seconds to 5mins 10secs. Ive tried IISRESET, rebooting servers thinking its a build up of cache but its taking 5 minutes 10 seconds to run the 7minutes and it seems to get worse as I add more. If there an underlining issue im not seeing?. at this rate it will take another 48+hours to create the rules I need. This is sometimes an issue with all the PowerShell scripts. Try splitting them into maybe 10 files of 60 “rules”. Let me know if it worked! Thanks for the reply, I did end up splitting them into batches of 60-70 but it would get progressively worse, At its peak it took 30 minutes per rule then when it reached the last two rules it took seconds….weird behaviour. I did notice some ULS logs complaining about Slow SQL Queries, but I’ve never been able to find more details in SQL.